Delve into kitchens around the globe and sample a vast array of culinary delights with this beautifully illustrated book. Uncover tasty treats, unique utensils and fascinating food facts as you experience the diversity of foods from around the world. This book is packed with fun facts and information about our relationship with food, from customs and traditions, to playing with food and how food is an important part of festivals and celebrations in many cultures. 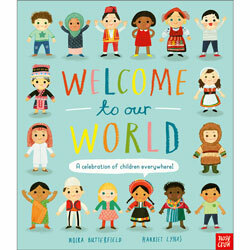 Foods of the World is aimed at ages 7 - 11 and is a good introduction to global diversity and intercultural understanding.